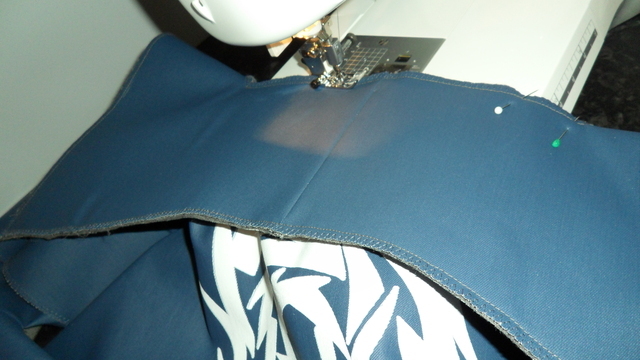 Shiro Samurai's Cosplay: Masamune's coat pt.1 - Sewing it! Today I got the inspiration to continue working on my Date cosplay. 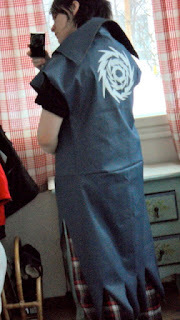 This time the plan was to sew together the parts of the battle coat. There's a lot of photos because I'm documenting my progress for a school project. So with that said let's go! First up of course is to sew the shoulder seams. 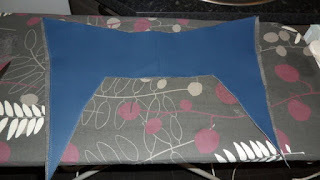 I took the back piece, laid it on the ironing board (which acts as my working table) with the right side up and then took the two front pieces and put them with the right side down against the back piece. 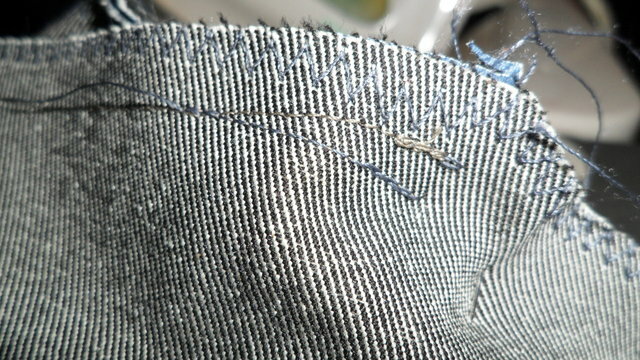 Then I just sewed them on with a straight stitch. Next thing was to determine how big I wanted the arm openings. I just took a measurement tape and decided that around 28 cm from the shoulder tip seemed okay.. according to my eye measure. 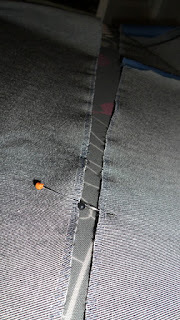 I put a pin to act as a mark and then just sewed the sides closed, starting from the pin (aka where arm opening ends of course) and sewing all way down with a straight stitch. With the arm opening marked.. I did an extra horizontal stitch at the arm opening's end for strength. 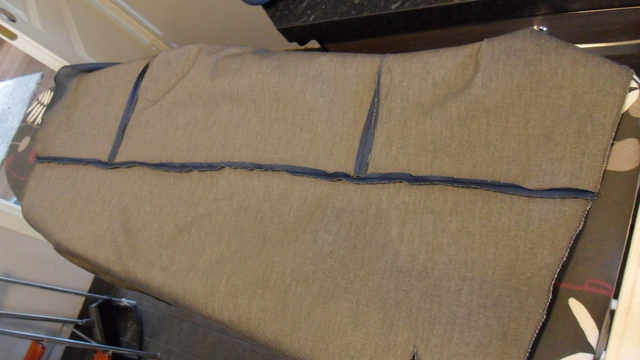 With both side seams closed I decided to iron the seams open for a neater appearance. 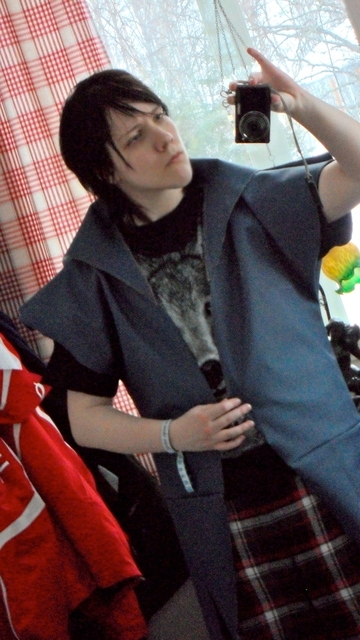 Also it's easier to do now while the spiky lower part of the coat isn't yet sewn on. I put the iron on the second lowest setting (just one dot) just to be on the safe side because, as I have noticed earlier, this fabric has a plastic coating on the right side and tends to roll up when heated. I also put my PSP case on top as a weight. After I had ironed the seams open.. The next thing to do was to sew on the spiky part. 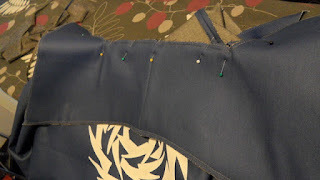 Now I remembered having added some extra length to the front pieces when cutting them out, even though I knew the total width of the back piece together with the front pieces would fit together perfectly with the lower spiked part. Needless to say with the extra length added to the front pieces the spiky part ran a little short on both ends. To see exactly how much excess length there were at the front pieces I took out the center points on the spiky part and on the back piece by folding both in half and putting a pin at the fold. I decided to sew the lower spiked part on, starting from the center and going outwards. 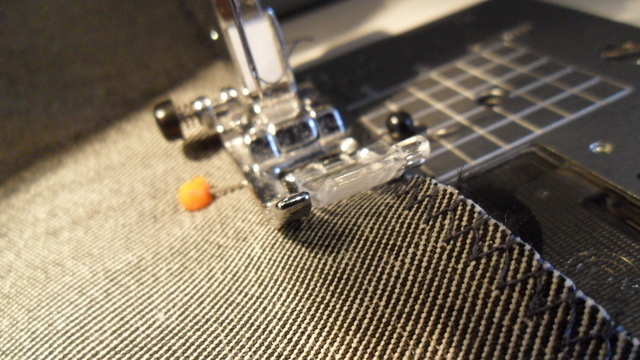 This just to make sure the fabric wouldn't move itself off-center while sewing if I had started from an edge. 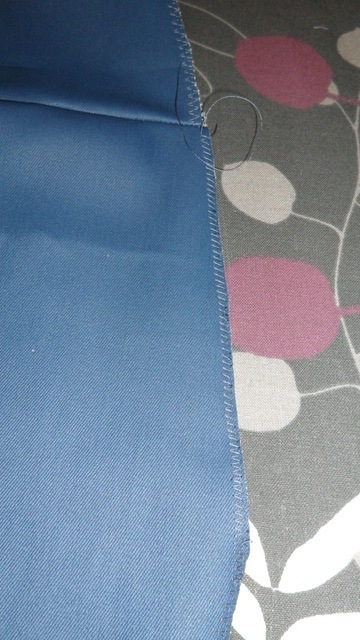 Starting to sew the two pieces together. 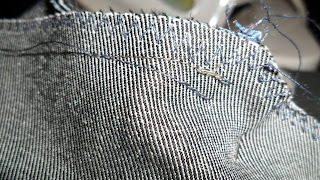 Right sides together of course and a straight stitch. When I was done I noticed the excess was around 6 cm on both sides. 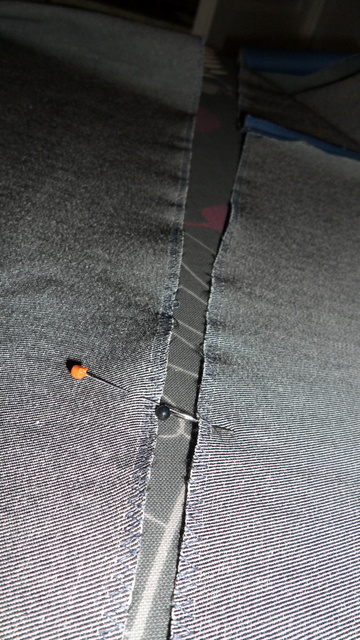 I temporarily folded the excess length inside into a small triangle and pinned it in place. At this point I went to quickly put the coat on in front of a mirror. I have no pictures of that but I can say that I noticed the arm openings were waaaaaay too small and because of that the whole fit of the coat looked.. well.. stupid. 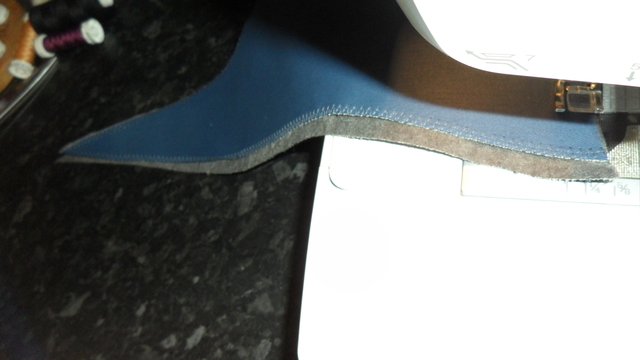 I then went back to unstitch around 10 cm from each side seam to get bigger arm holes. Of course I put a new marker pin in place on both sides so I wouldn't rip up too much. To make my cosplay life harder the seam ripper has been missing for some time now so I had to make do with small Scizors scissors instead. 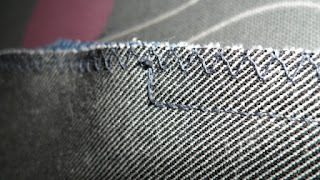 With both side seams partly ripped up I went and reinforced the stitching closest to the unstitched parts and then redid the horizontal strengthening stitches, like seen on picture 5 from top. Now I had bigger and more well-fitted arm openings. With the arm holes fixed and not bothering me anymore I went back to fix the excess length of the front pieces... by cutting it off. 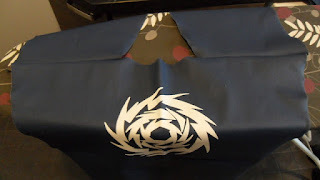 Because they had been folded for some time there was now a slight folding line that I could follow to get the cut right. And of course I re-zigzaged it. 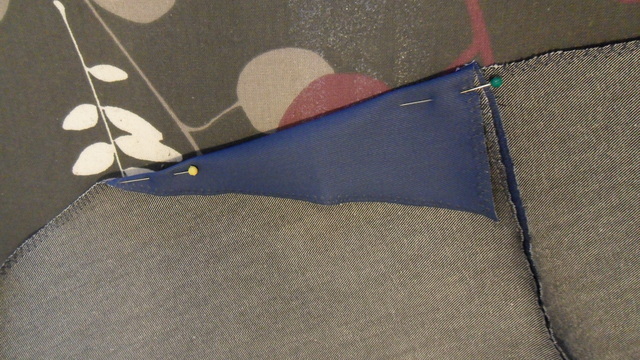 I also decided to open the seams of the lower spiked part now that it was attached. 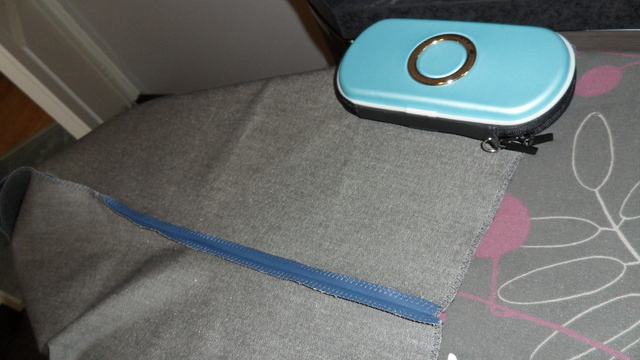 It just looks nicer on the outside when the seams aren't bunched but instead lay flat. 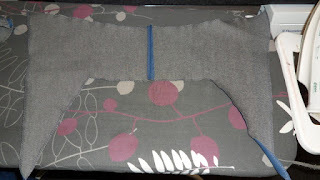 Now only the collar was left to sew on for the coat to be whole... excluding the white trims which I will add another day. Okay, the collar. I had four collar pieces (inside and outside halves) so I just took two of them and sewed them together at the end to get one whole collar piece. One collar piece with center seam ironed open.. 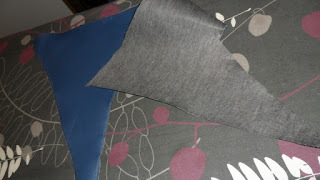 I needed the collar to be sort of stiff so I took some interfacing fabric and cut out fitting parts and ironed them onto the fabric's wrong side. Obviously glue side against the wrong side. I did cut the interfacing fabric in half for ease of ironing it on. A bigger piece is harder to iron on without it moving and wrinkling itself at some point. 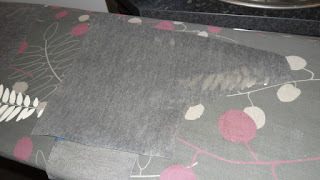 A fitting bit of interfacing fabric cut out for half the collar length..
Interfacing fabric ironed on and excess cut off.. I repeated the process for the second collar. When both collars were done I matched them up with wrong sides together and noticed they weren't exactly the same size. Bleh. I had to trim the bigger piece slightly at the edges to get them to match better. 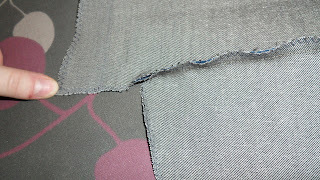 They were still not perfect but at least I could start sewing them together with a straight stitch. But. While I had sewn one half of the collar and got to the other half I noticed that if I matched up the angled point where the tip starts, aka where the collar will touch the shoulder seam, the edge mismatched even more. 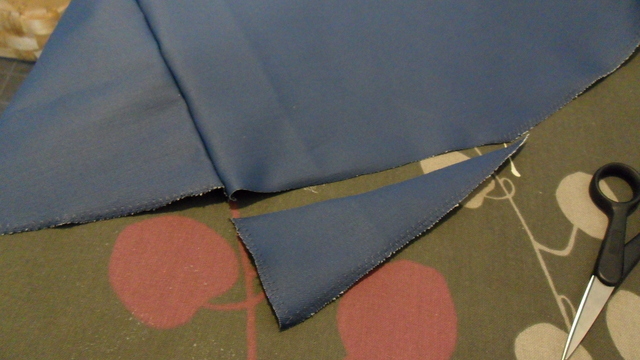 Getting the angled shoulder attachment point to match was more important than to get the edges to match so I just cut off a part of the edge while sewing. 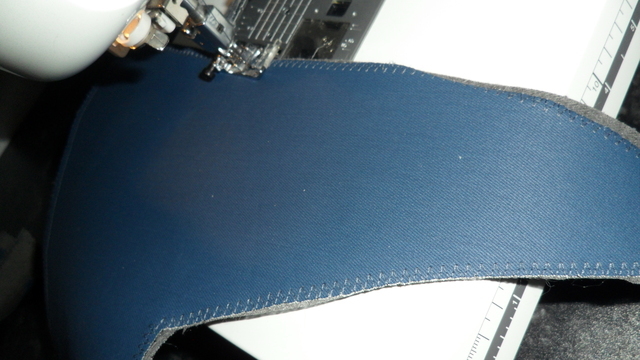 The edge that wouldn't match if the shoulder attachment point matched..
.. so I trimmed it and continued sewing the collars together. 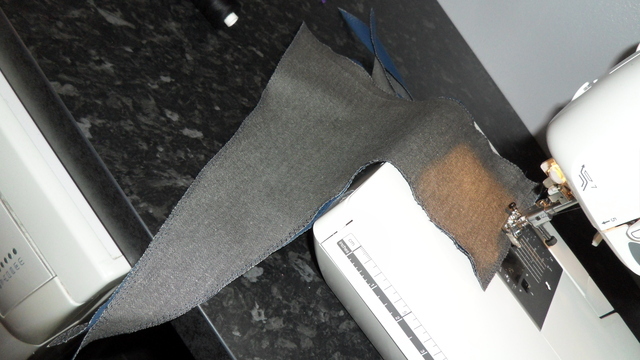 With the collar now having an inside and outside piece and being whole I test pinned it in place. 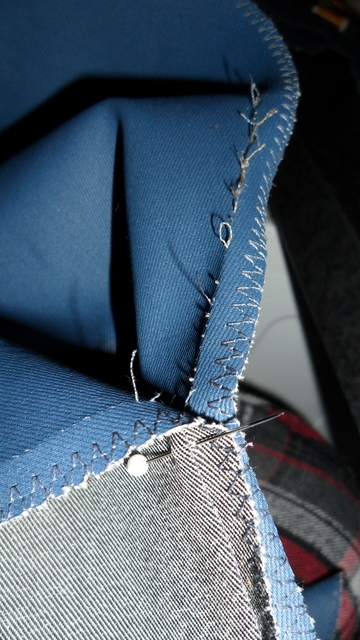 I noticed one of the shoulder seams didn't meet up at the right point so I had to fix that. 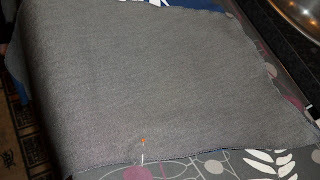 Shoulder seam modified. 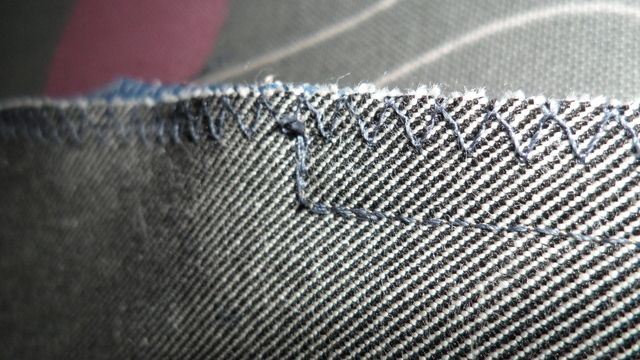 The lighter seam is the original one and the more blue-ish one is the new one. 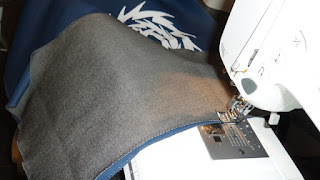 With the shoulder seam made to go together a little "earlier" than it originally was it fit together with the collar's angled shoulder point and made it possible for the collar's "tip" to run down the upper front of the coat without a lot of forced bending and risk for bumps. With that problem fixed I pinned the collar in place again and sewed it on. While sewing I had to constantly form and bend the collar's "pointed tips" so that it would run along right with the front pieces curves. With some patience and being careful it turned out well! With the collar on I went to try the coat on again in front of a mirror. I'm pretty pleased with it so far. Here's two (rather crappy) mirror photos. There's only one thing I wonder if I chould change a bit and that's the width of the collar.. I'm kinda split if I should or not because in a way I like the collar when it's big and more cartoony.. it looks a bit sumptuous I guess. Then again if I don't bend it a bit at the back (or if I let it stand up, which it can do) it looks like a Dracula collar and I'm not sure if I want that effect lol. If I made it a bit smaller it would be.. well.. smaller and the opposite of what the bigger collar looks like; a bit more restrained and sophisticated. Then again Masamune (or well, whole Sengoku Basara cast) is more the person to be over-the-top... argh I can't decide! Any outside opinions? 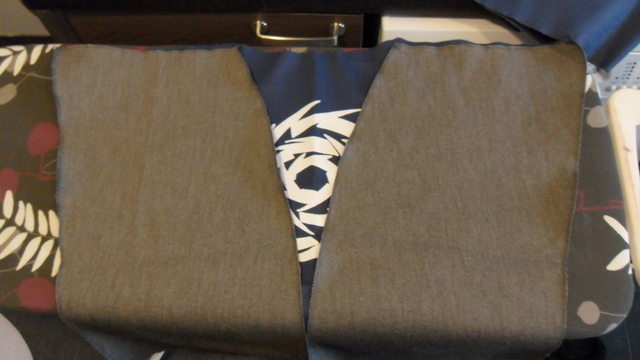 I guess you could let the collar stand up or fold it depending on how you iron it before wearing it, but I can't know for sure, obviously... My opinion is that as it is now it looks great when folded like on your second to last pic but it looks a little weird on the back (still when folded). I can't tell about Dracula style collar but I think it would gain to be smaller if you intent to let it stand up. kl;fdsjksljdfk OMG You look so awesome in that coat!! 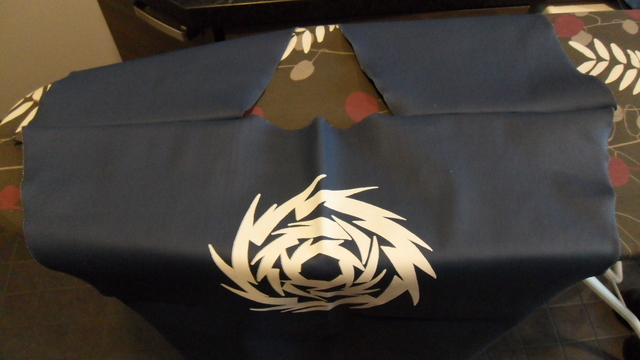 >8D It's looking really cool now that it's all coming together! So glad you were able to get the arm holes adjusted to a better size, even if it was a hassle. Great job at troubleshooting those issues of pieces not lining up as well! As for changing the width of the collar, reducing it a little bit might help it so you can stand it up without it looking so much like a Dracula collar.